Happy Spring! Or in our parts, its was spring on Wednesday, and today, snow flurries. Anyways, what better way to celebrate good weather/drown our sorrows about bad weather than a little bit of fabric shopping?? And even better when its on sale! 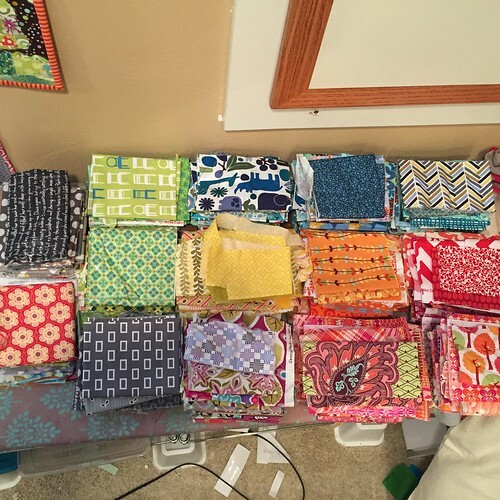 Now through Tuesday March 31st Rose Room Quilts has all fabric bundles 20% off! 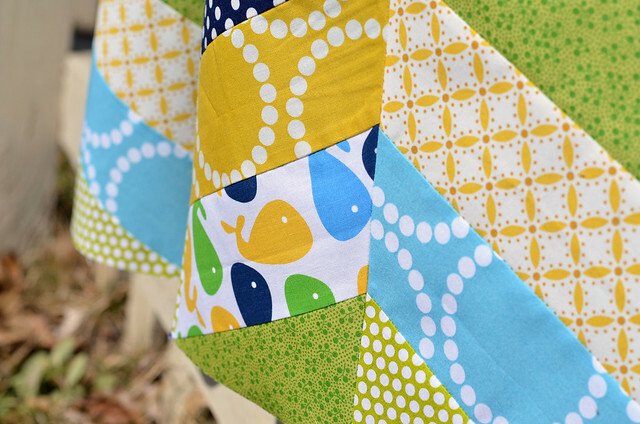 I have another baby boy quilt to whip up, and these fabrics seem to be calling my name! 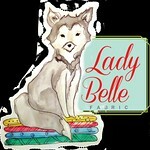 Lady Belle Fabric has Tula Pink's Elizabeth in stock, and the Fat Quarter Bundle is discounted! 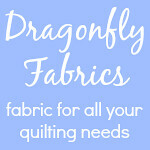 Dragonfly Fabrics is running an awesome sale through Sunday, March 29th, all Cotton and Steel fabric yardage is 15% off! Use code CandS15! I don't know about you but I just want to buy up all the viewfinders! 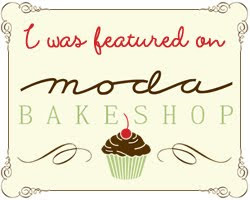 Have a great and hopefully spring-like weekend, and happy shopping! This past weekend I had an itch to make a quilt. It's been entirely too long, and with two friends just having babies in the past month, it was good timing! 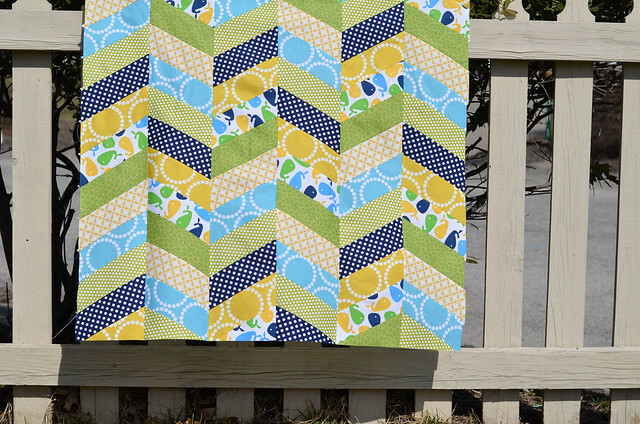 I wanted something simple that I could put together in one or two naptimes, so I took to pinterest for inspiration, and came across this quilt and knew it was just perfect. 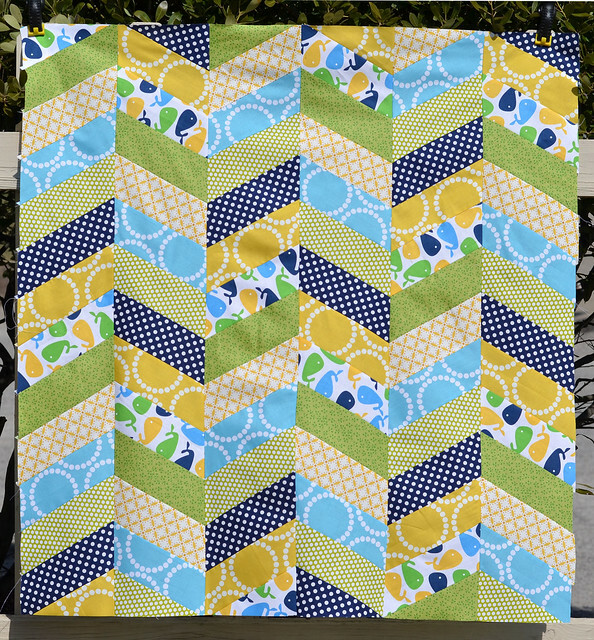 I for one believe you can never have too much chevron or herringbone in your life so this quilt fit the bill. I did a little stash shopping, and dug out this Ann Kelle whale print, one of my favorite kiddie prints. 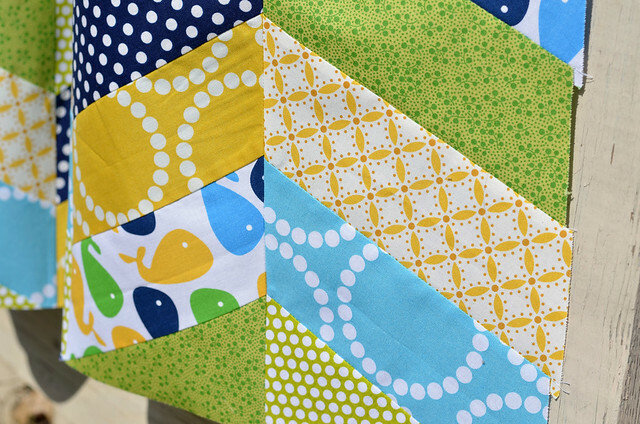 I picked out a few other blues, greens and yellows that coordinated, and got to cutting! 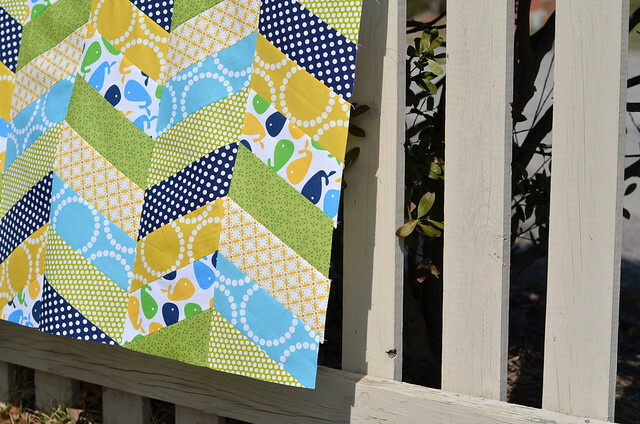 A naptime and a half later this quilt top was born. I just love it to pieces, and if I ever have a boy myself, I think this is the inspiration for his one day nursery. So bright and bold, and FUN! I'm hoping to get this basted and quilted this weekend, so it can be off to its new home for lots of baby snuggles! 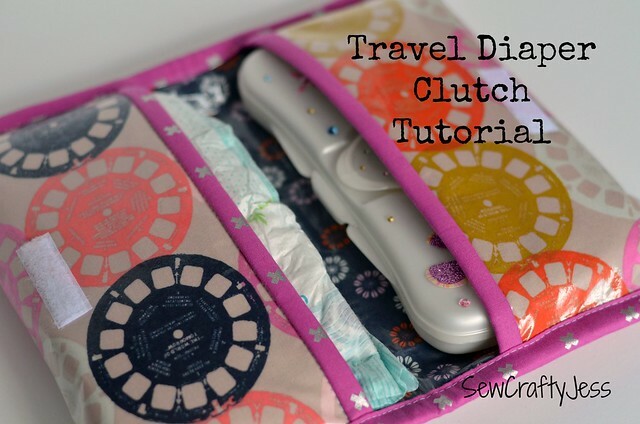 As promised, I'm back with a tutorial for the super simple travel diaper clutch I shared last week! This really is so easy to make, and comes together well within an hour. Go ahead, make one for your self, and then one for all of your friends, as everyone should be carrying diapers in style. See below for the tutorial, or download the PDF version for easy printing. If you make one, I'd love to see it! 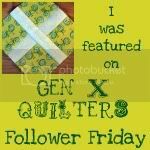 Tag me on Instagram @sewcraftyjess, or add it to the SewCraftyJess Flickr group! Folded Finished Size: 6.5" x 10.5"
Outer fabric: 22" x 10.5"
Lining fabric: 22" x 10.5"
Binding fabric: (2) 11" x 2.5", (2) 13.5" x 2.5"
Sew-on Velcro 2" x 1/2""
Fusible fleece*: 22" x 10.5"
Iron-On Vinyl*: (2) 22" x 10.5"
2. Following package instructions, apply iron vinyl to right sides of both outer fabric and lining fabric. 3. Layer outer fabric and lining fabric wrong sides together and pin. Baste layers together using 1/8" seam allowance. 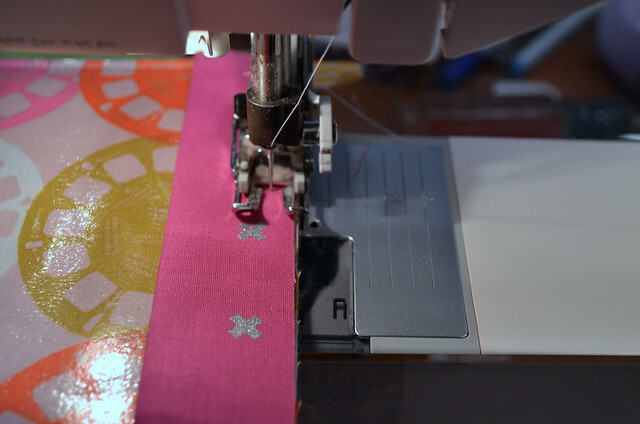 Note: If using iron-on vinyl, keep your pins within 1/4" of the fabric edge so the pin marks are hidden within the seam allowances of the finished product. 4. Center velcro 2" in from each 10.5" edge of the outer fabric (below picture shows 3", pretend it shows 2"), and sew in place. 5. 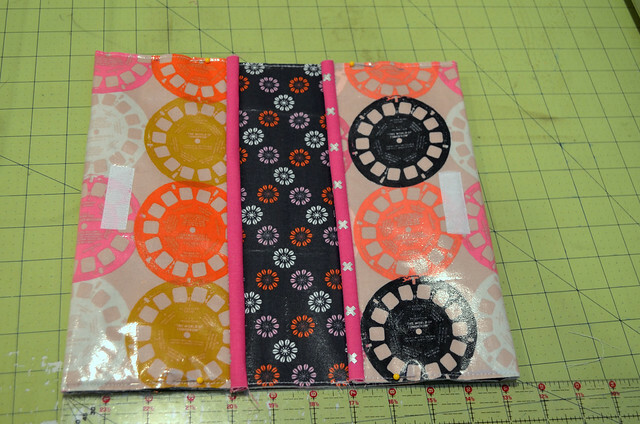 Take the (2) 11" x 2.5" binding strips, fold in half lengthwise, press. 6. 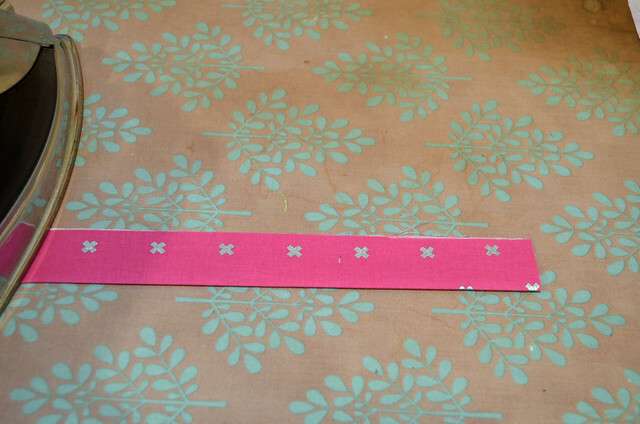 We will attach (1) binding strip to each 10.5" edge in the same manner as applying quilt binding. 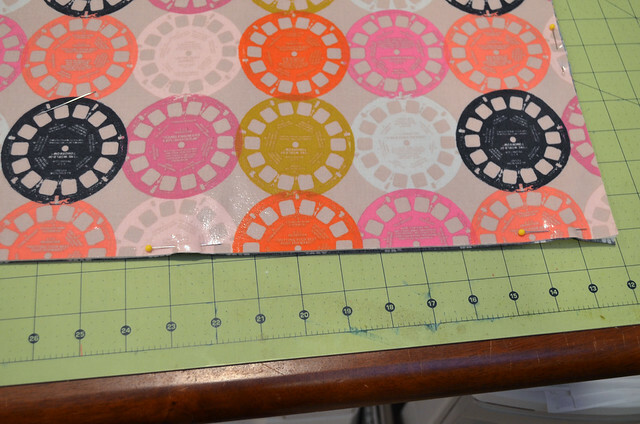 Align the raw edges of the binding with the outer fabric raw edge of the 10.5" side, sew with 1/4" seam allowance. 7. 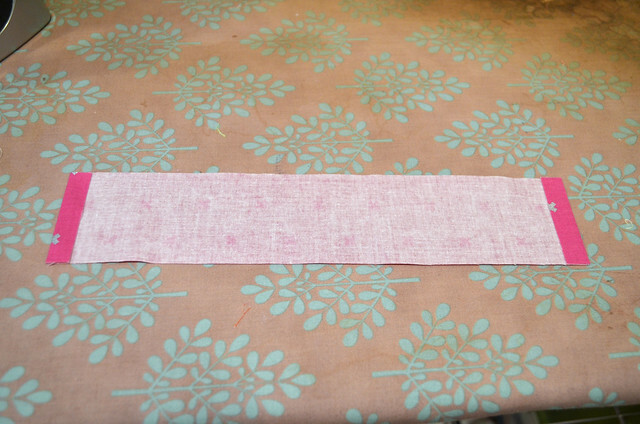 Fold the finished edge around to the back of the fabric (lining fabric side). Stitch in the ditch from the outer fabric side, catching the finished edge of the binding on the lining side of the fabric sandwich. 8. Fold each 10.5" edge in towards the center, creating (2) pockets that measure 4.5" x 10.5". Baste in place following basting stitches from step 3. 9. Fold short edges of remaining (2) binding strips 1/4", press. 10. Fold in half lengthwise, as in step 5. 11. Apply binding strip to each unfinished edge as in steps 6 and 7. 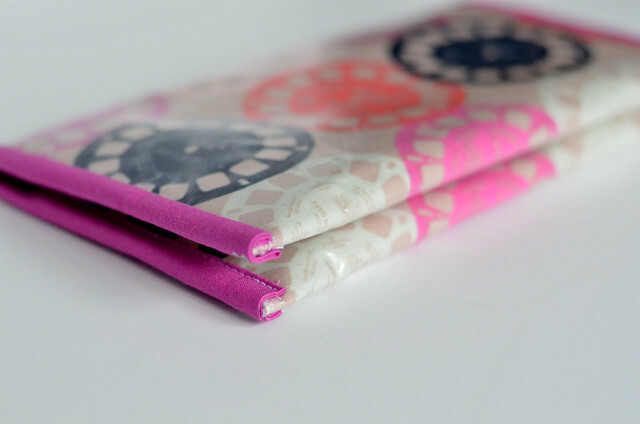 I prefer to begin applying binding to the "outer fabric" of the pouch, and fold binding around to the inner "pocket side". 12. 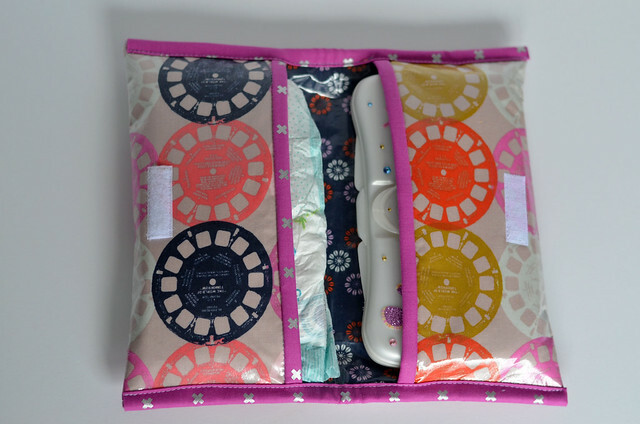 Fill your new stylish diaper clutch full of diapers and wipes, enjoy! 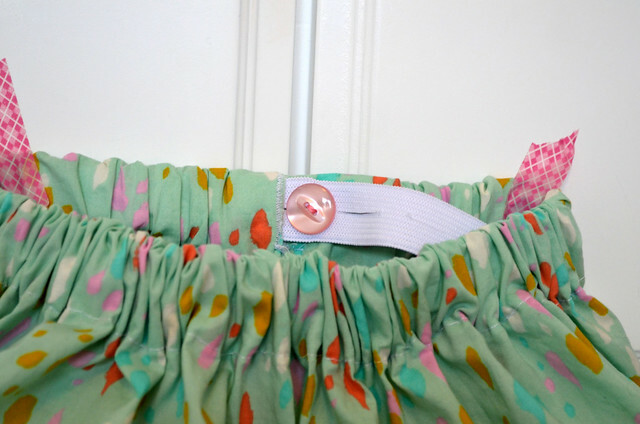 I'm so excited to be here today as part of the Little Lady Liberty Blog Hop to celebrate the release of Alice Caroline's book Sew Pretty for Little Girls (ebook version) (called Little Lady Liberty for UK peeps). When Alice asked if I wanted to take part, yes couldn't come out of my mouth fast enough. 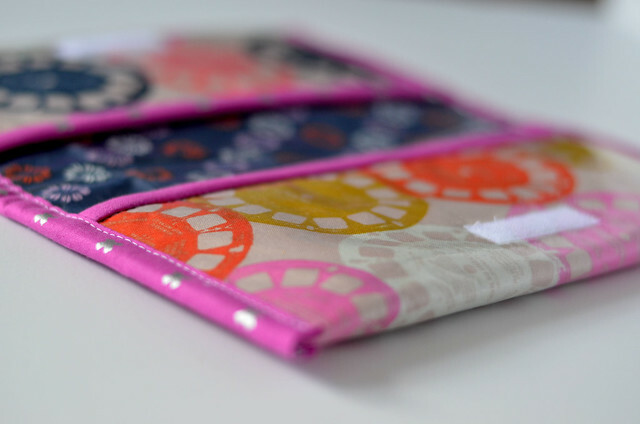 Aside from the book being chocked full of 20 beautiful projects for little girls, its dripping in Liberty fabric eye candy! 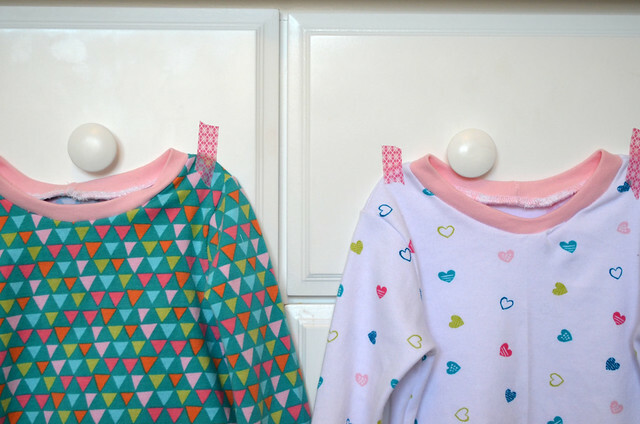 The book is divided into three sections, Blissfull Bedrooms, Twirly Girly Garments and Pretty Little Things. 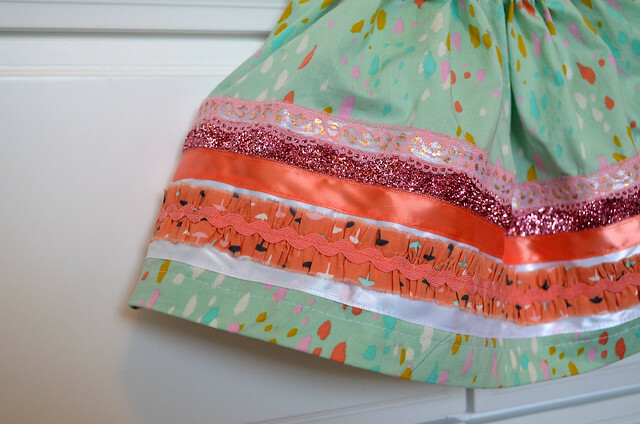 It was almost impossible to pick just one project to make but ultimately I decided on the Fleur Embellished Party Skirt, because Nora definitely cannot have too many skirts in her closet. I chose a Cotton + Steel lawn print to get a similar drape and hand as the Liberty fabrics shown in Alice's book, and I cannot be happier with how it turned out. 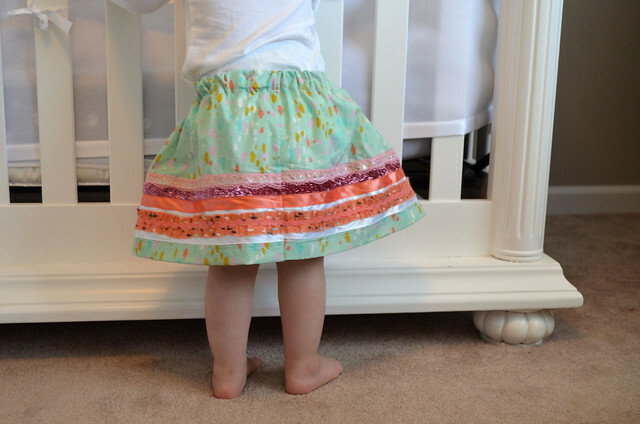 I altered the length of the skirt slightly as the book shows cutting measurements for average size for a 6-7 year old girl, but the size customization tips in the pattern worked like a charm. Nora gives her seal of approval too! 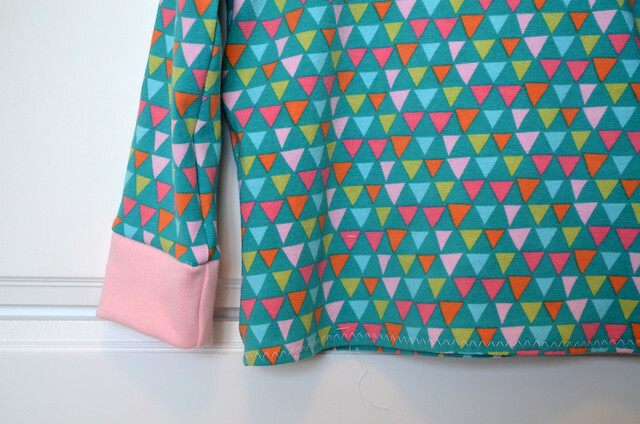 I have fabric purchased to make the Libby Ra-Ra skirt next, now just to find a few minutes to put it together! Now for the giveaway! 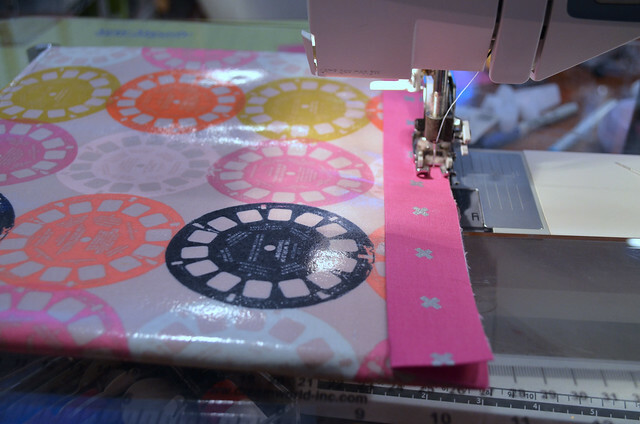 Stitch Craft Create is giving one lucky SewCraftyJess reader an ebook version of Sew Pretty for Little Girls! Enter the rafflecopter giveaway below for your chance to win, winner will be announced here at SewCraftyJess on Tuesday, March 24, 2015. So I've been toying with purchasing a serger for a while now. 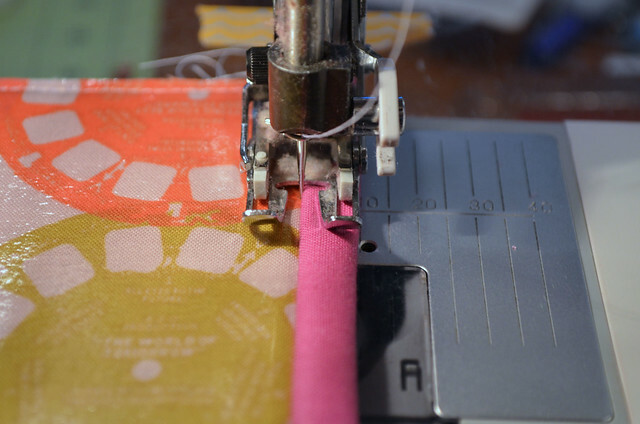 Pretty much every time I veer into garment sewing territory, I get the itch. "This would be so much easier if I had a serger" runs on play back the entire time I am sewing. Usually my garment sewing kick is incredibly short lived and I forget about it for a few months. Enter the Julia Cardigan. I saw someone post about this cardigan on Instagram, and immediately decided I needed to make it. I am eternally cold at work, so cardigans are always in short supply, and I can never have enough. I have never ever sewn with knits so I ventured in to Joanns, picked a jersey lighweight knit and a stretch needle, took advice from the lady at the cutting counter "just go slow, use a jersey needle and a zig zag stitch," went home and sewed with regular sewing machine. All was well, the cardigan turned out great, sewing with knits was not at all intimidating and I decided I needed many many more Julia cardigans in my closet. This pretty much sealed the deal that a serger was now in my near future. A few Google and Pinterest searches, and I learned that a serger is pretty much a knit's best friend and the deal was sealed. 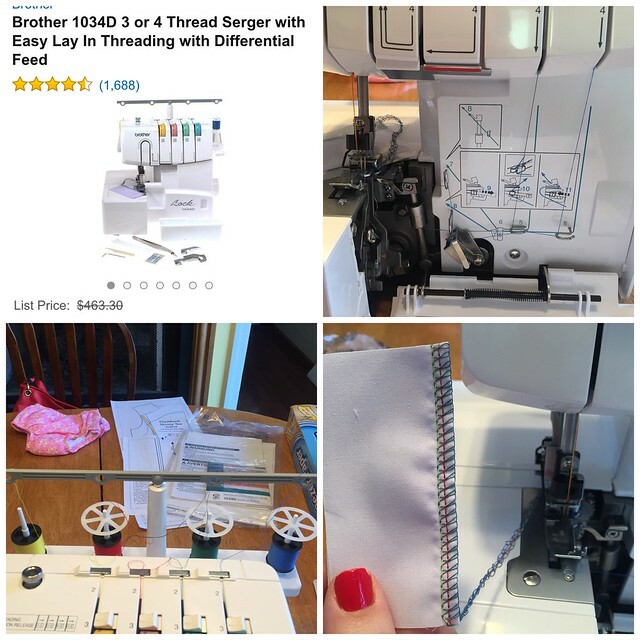 A few more Google-ings of "best beginner serger" led me to the Brother 1034D, and 2 days later this guy showed up on my door - thank you Amazon Prime! So after I got my new friend out of the box and got her threaded (huge thanks to this video) I decided to give this Flashback tee a try. 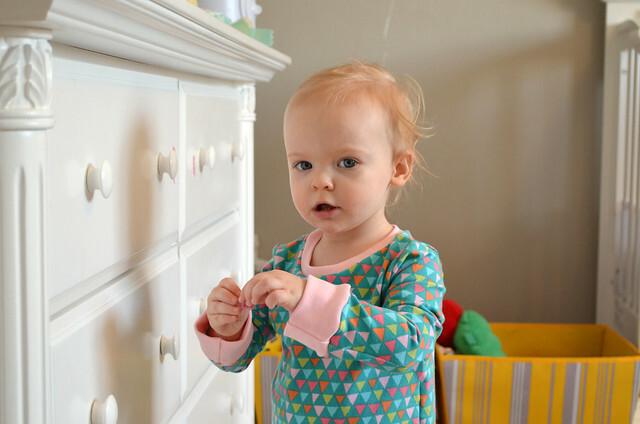 I had purchased this pattern thinking Nora can always use a few new tees and it did not disappoint. These sewed up like a dream and so incredibly fast thanks to my new serger friend. I just love how finished and professional my seams now look! 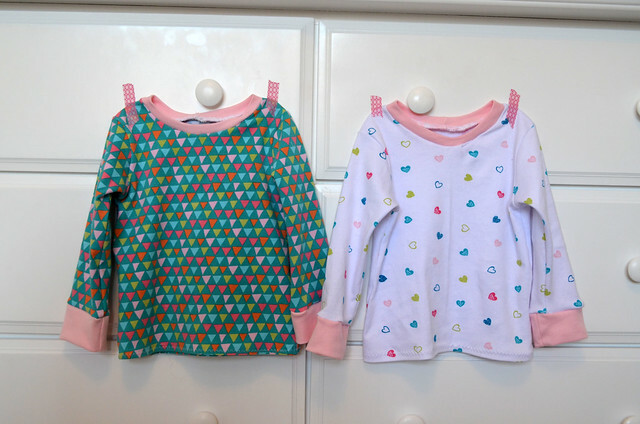 I have more knits on the way from Girl Charlee and have at least 2 more of these tees I want to stitch up. I am still getting the hang of how the serger works, I'm very good at edges that I don't need to worry about backstitching, but those finishing seams I'm a little in the dark about, as you can't make a serger go in reverse. If any of you have tips or suggestions, I'd love to hear them! 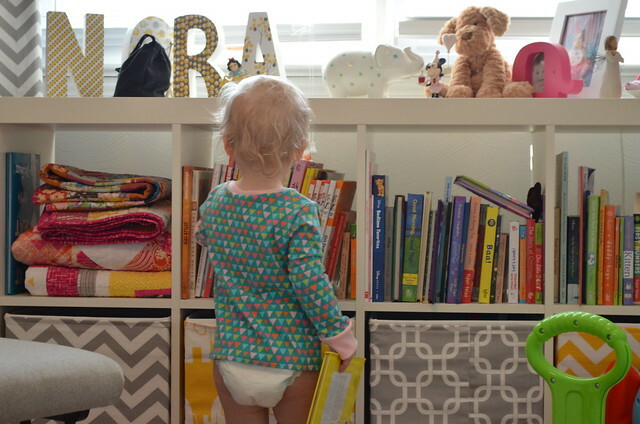 Nora seemed to give her stamp of approval, as they certainly didn't slow her down from partaking in her favorite activity of taking each and every book off the shelf and then moving on to the next exciting adventure of a 17 month old. She liked them so much she even wanted to try on the second shirt, as she is incredibly helpful like that. Yes, that's what it was, it certainly wasn't that she wanted to eat the pink washi tape. No that wasn't it at all. 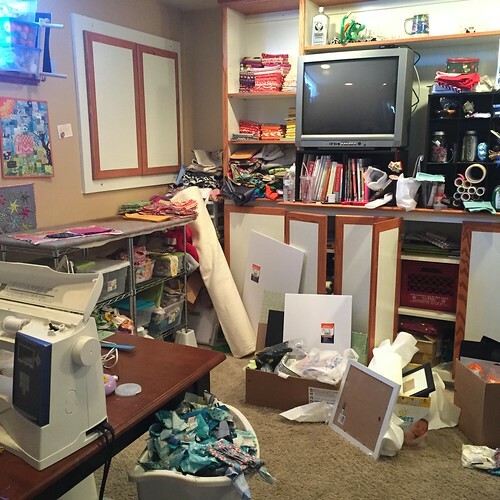 Stay tuned for more adventures with my new serger friend! Pretty please send your favorite tips and tutorials my way, I would absolutely LOVE to hear about them! 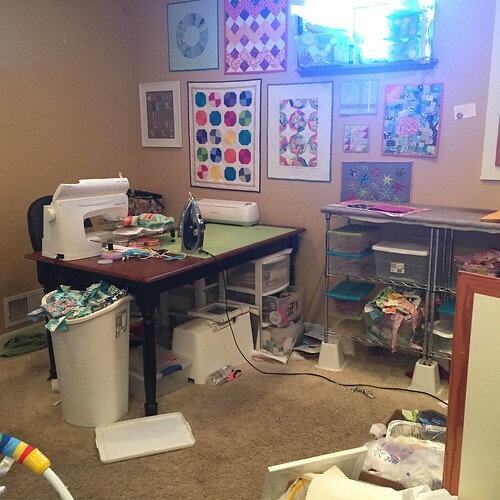 I decided this weekend that I needed a break from fabric sorting and organizational list making with regards to this hot mess, and just wanted to sew something. I wasn't overly picky, I just wanted to make something that could be completed in a naptime. A diaper clutch wasn't something I thought I actually needed up until now, but now that we are finally getting to the point that we can head out somewhere for a short time and not lug the entire Goliath size diaper bag with us, I have been thinking I could use something to stash a few diapers and wipes so that they aren't loosely floating around in my purse. 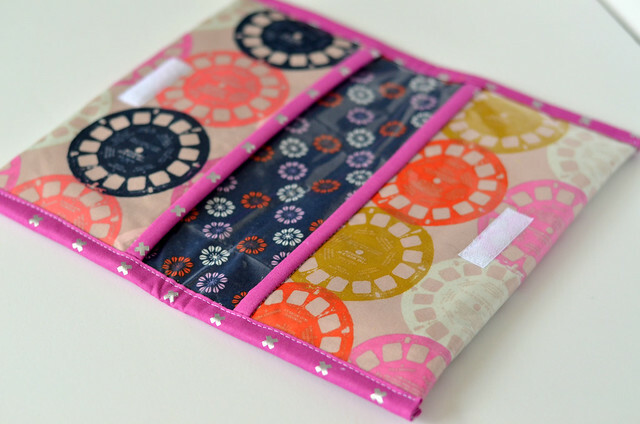 Enter this adorable (if I say so myself) diaper clutch. 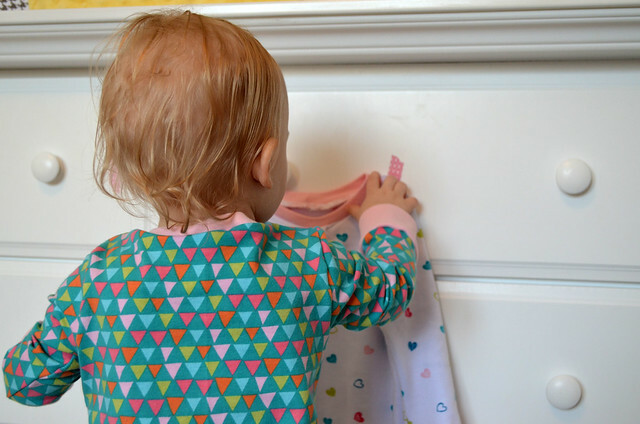 I checked around for a tutorial quickly and couldn't settle on something that met all my needs (small, cute, not overly time consuming to make, and didn't have a built in changing pad as I keep one of those in my car all the time anyways). So what does one do? 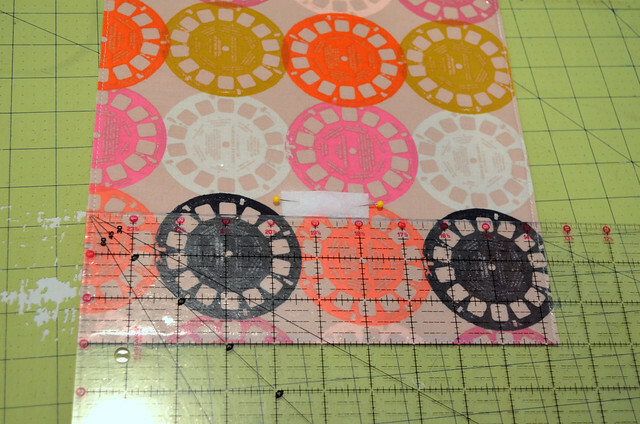 Of course scour pinterest for inspiration, get to sketching and traslate into fabric! 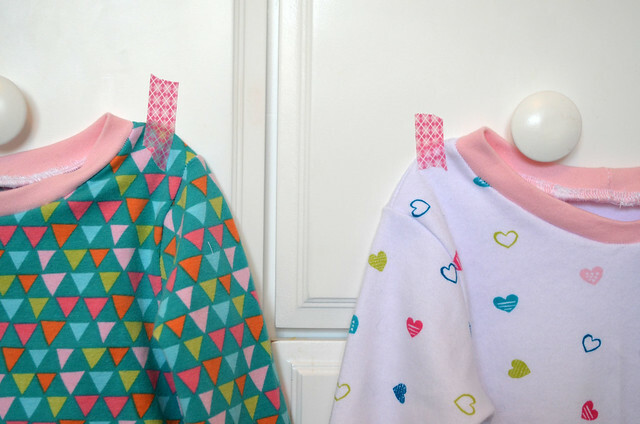 I purchased some Thermoweb Heat'n Bond Iron On Vinyl and thought this would be the perfect project to try this stuff out on. Oh. My. Goodness. How have gone this long without trying this stuff out! I love it, and in fact am thinking of projects just so I can use more of this stuff. 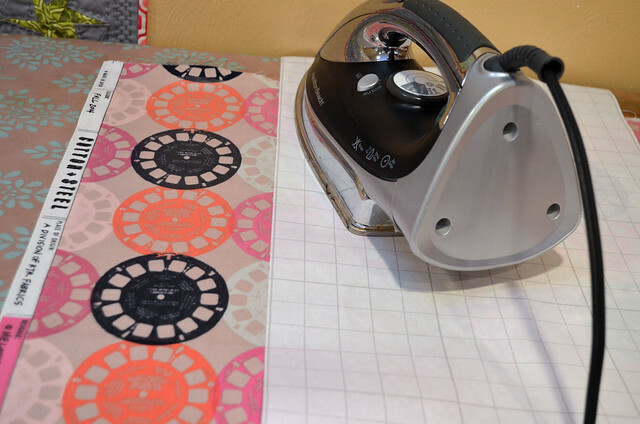 In case you are not familiar, it turns any sort of standard cotton fabric into an oil cloth like fabric by ironing on a clear vinyl to the right side of the fabric. Genius. 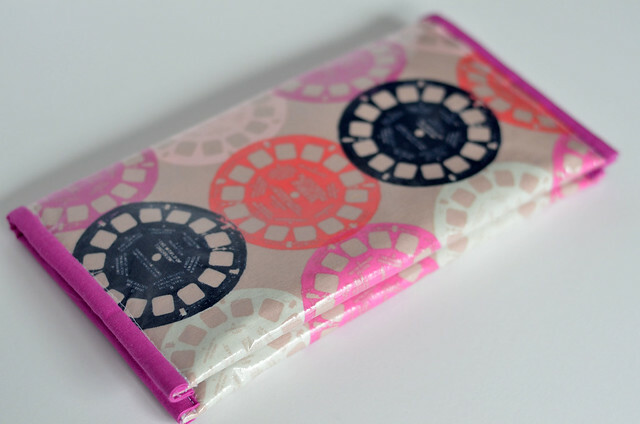 Since this little clutch was purely for my benefit (lets face it, mommy does about 99.5% of the diaper changes when out and about) I cut into my Cotton + Steel stash, as what better fabric to tote diapers and wipes around in than some super fun View Finders, and pink ones at that! I really could not be more pleased with how this turned out, and lucky for you, dear readers, a tutorial is in the works, you know in case you also want to carry diapers and wipes in style. I want to make a second clutch and play with tweaking some of the measurements before finishing the tutorial, but it should be good to go by next week. Just a quick #honestcraftroom update, the stars have aligned, as I have convinced my hubby to take an Ikea trip with me on Saturday (I may have bribed him with his choice of lunch venues, and spun it as a date), AND my mom is free to babysit Nora for the afternoon, double score! Hopefully by Saturday evening I will at least own the necessary tools to get organized!